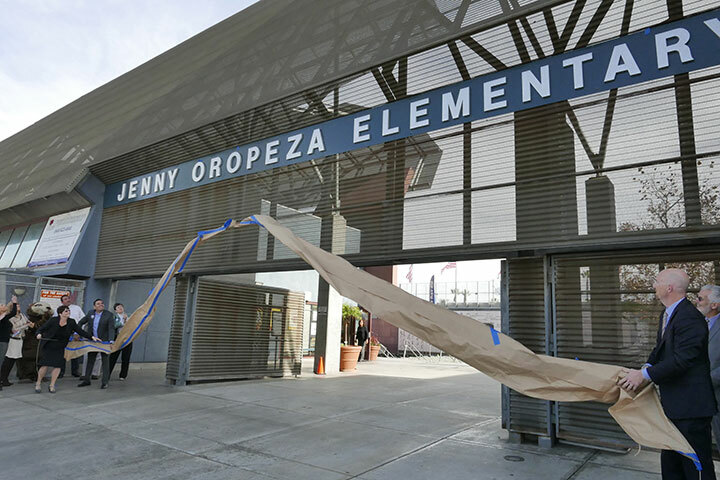 Jenny Oropeza Elementary School, formerly International Elementary, dedicated its campus in honor of the school’s namesake this week with the help of students, parents, community leaders and members of the Oropeza family. The event in the school’s center courtyard included performances by Mariachi Playa Larga, a student group from Cal State Long Beach. Afterward, guests gathered in front of the campus for the unveiling of the school’s new signage. “This is a special day,” Long Beach Mayor Robert Garcia told the school’s fifth graders, who participated in the main ceremony and will be the first class of students promoted onto middle school from the newly named K-5 campus. “You will all be going to a school named after an incredible, amazing woman,” Garcia said. He described Oropeza as a role model who paved the way for people like him. Oropeza was the first in her family to attend college when she enrolled at CSULB. She was the first Latina to be elected Associated Students President and first to be elected twice as A.S. President at CSULB. She was also the first Latina to serve on the CSU Board of Trustees. Twice elected to the Long Beach Unified School District Board of Education, Oropeza advocated successfully to change LBUSD elections from at-large to by-district making it possible for the first Latino/a and African American to be elected to the school board. Oropeza was the first Latino/a to be elected to the Long Beach City Council, serving two terms. She was elected three times as a State Assembly member and twice as a member of the State Senate. During her time as a community activist, Oropeza fought for affordable, quality education, a clean and healthy environment, healthcare, public transportation, cancer prevention, food for those in need, and veterans’ benefits. Among the speakers at the dedication ceremony was Congressman Alan Lowenthal. Also speaking were the school’s principal, Mona Cook, LBUSD Deputy Superintendent Ruth Ashley (who served as principal of International when it first opened), LBUSD Board Member John McGinnis and Long Beach City Councilwoman Lena Gonzalez. Ashley presented a photo of Oropeza attending International’s dedication ceremony in the same courtyard in 1999. Accepting the photo was Tom Mullins, who was Oropeza’s husband until Oropeza died in 2010 at the age of 53 while undergoing treatment for a blood clot in her abdomen. Oropeza also was a cancer survivor. Fifth grader Pearla Meza recited an essay honoring Oropeza. LBUSD’s Board of Education decided in July to rename the school based upon the recommendation of a committee of community members facilitated by district Deputy Superintendent Jill Baker. The school’s new name took effect Aug. 1. School Board Member John McGinnis, addressing the students, acknowledged the important positions of public office that Oropeza held during her career. Oropeza friend and mentor Carmen Perez delivered closing remarks. UNVEILING – School and community leaders unveil new signage at a renaming ceremony for Jenny Oropeza Elementary School, formerly International Elementary.